In Garms Family news, the most exciting thing besides some of us trying Spam for the first time during lunch today is (and yes, most of us liked the Spam)…contributing for SouthernGospelBlog.com. We discovered SouthernGospelBlog.com after I noticed a considerable leap in YouTube views on the video of Caleb and Legacy Five. Puzzled, and instantly curious, I googled “seven year old boy sings with Legacy Five”, and found Daniel J. Mount had featured the video on his blog, SouthernGospelBlog.com. We once stumbled across his blog while doing some research on a favorite group, and I had heard of Daniel J. 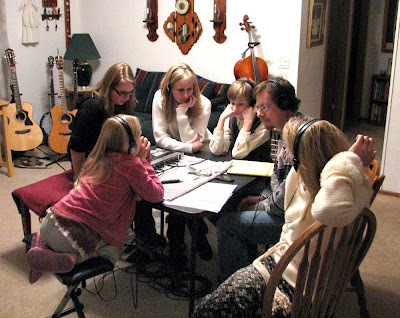 Mount on various other Southern Gospel blogs, but we weren’t regular visitors. Suffice to say, we were surprised, and enjoyed reading all the comments about the video. We later struck up an email conversation with Daniel, and SouthernGospelBlog.com soon became a favorite site for our family, as we loved the current news and commentary about the genre. Over the course of about four months, we joined into the Southern Gospel conversation, and had fun sharing thoughts and opinions. Most of the family during the phone conference; Caleb, understandably, opted out when things started “going over his head” (that’s what he said! ), and Ben is snapping the photo (Why do I still say “snapping”? Everything’s digital nowadays!). If you love Southern Gospel Music, then SouthernGospelBlog.com is the place to be. Visit today to read interviews with your favorite artists, reviews on new CDs, interesting commentary, and lots more. That picture is really cool! 🙂 Thanks for posting!